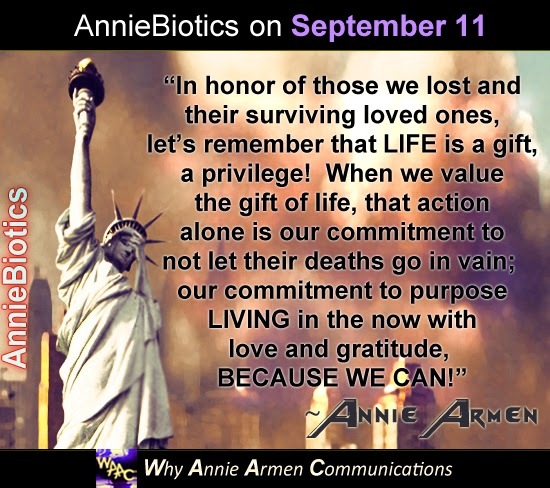 Why Annie Armen: Celebrate the Gift of LIFE Because you can! Celebrate the Gift of LIFE Because you can! “For me and my family personally, September 11 was a reminder that LIFE is fleeting, impermanent, and uncertain. Therefore, we must make use of every moment and nurture it with affection, tenderness, beauty, creativity, and laughter.” -Deepak Chopra, M.D. Loss, Survival, Courage, Conviction and LOVE! I remember I had just arrived in Cairo, Egypt (first trip) when all of us watched news footage of the twin towers go down while at Cairo airport. At that time, flew out of New York straight to Cairo, Egypt to speak at an event, and then this life-shattering news! To date, I thank God daily for being given the gift of life as my life could have ended right then and there in the event of a flight delay. In honor of those we lost and their surviving loved ones, let's remember that LIFE is a gift, a privilege! When we value the gift of life, that action alone is our commitment to not let their deaths go in vain; our commitment to purpose LIVING in the now with love and gratitude, because we can! So dear friend, celebrate the gift of LIFE, because you can! Would you like to take this moment to express what's in your heart and mind, as we remember September 11 together? 6. 20 Quotes on VALUES in Business and in Life! 11. Did you say Can't? Are You Leaving Your AUTHENTIC Mark?